Auriga is the Charioteer constellation, and in Greek mythology various stories are told of who the charioteer is meant to represent. One possibility is Erichthonius of Athens, a king born of the earth when Athena rejected the advances of Hephaestus. King Erichthonius was credited with inventing the quadriga, the four horse chariot. Alternatively, Auriga could be said to represent Myrtilus the charioteer of King Oenomaus, who died at the hands of Pelops; or else it was Hippolytus, the son of Theseus, who was killed in a chariot accident; or it is Orsilochus a man from Argos who was said to have invented the chariot. Depictions of Auriga often see the man in a shepherd role holding a goat in his arms. 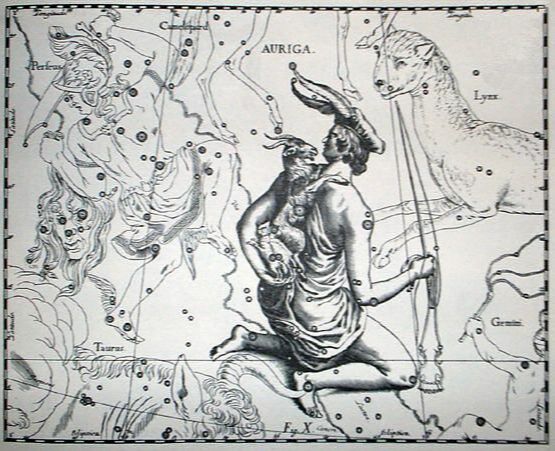 This goat was called the constellation Capra, and was said to represent Amalthea (or Amalthea’s goat), which suckled Zeus, Aex Pan, the goat wife of Pan, or Aex Helios, the goat whose skin became Zeus’ shield.